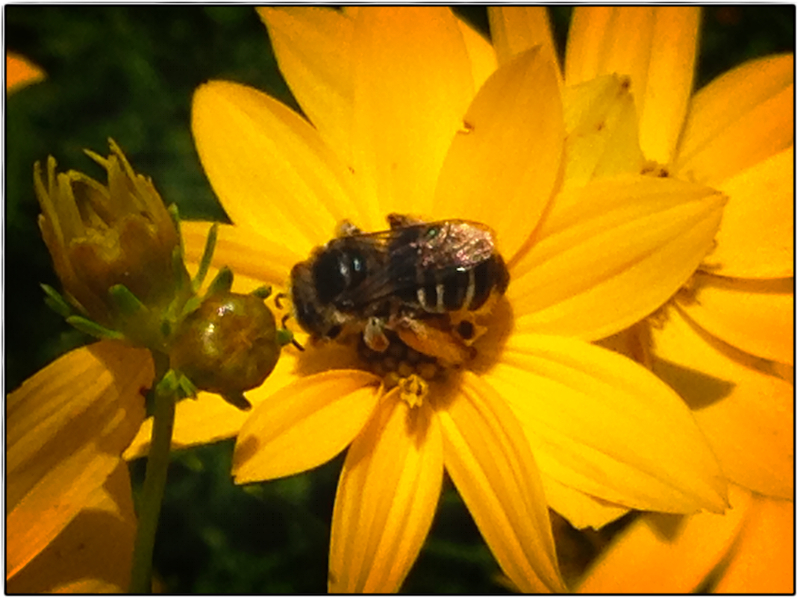 Falvey Memorial Library :: Don’t be a Buzzkill – Help Save the Bees! Don’t be a Buzzkill – Help Save the Bees! Busy on the coreopsis in front of the Chapel. Although we may not necessarily think of the summer season as a time for work, we depend greatly upon one sweet friend to humankind that is always keeping busy in the sun – the honeybee. We use the Chaucerian phrase “busy as a bee” because these insects commonly fly three to four miles a day (although it can be twice as much) to gather pollen and nectar. It is estimated that a one pound jar of honey requires almost 10 million foraging trips to produce it. That’s pretty busy! Unfortunately, these gentle beings are often confused with more aggressive insects like certain hornets and wasps (learn how to tell the difference), so don’t fear if a honeybee lands on you. Stay calm and it will carry on. Otherwise, it can smell the pheromones that are released when we experience fear and anger; these can become a trigger for bees to sting. Bees and honey have featured prominently in mythology, religion, birth rituals, weddings, funerals, traditions and superstitions for millennia. The ancient Greeks believed that a baby whose lips were anointed with honey would become a great poet or a mellifluous speaker. The Roman poet Virgil called honey “a gift from heaven” (Georgics, IV) for very good reasons becaluse honey not only tastes divine, but also contains many nutritional and medicinal properties. Gathering wild honey is one of the most ancient human practices, as rock paintings from circa 13,000 BCE indicate. However, there is a relatively recent phenomenon that is threatening the well-being of the honeybee and the viability of current agricultural practices. In 2006, a syndrome called colony collapse disorder (CCD) was widely publicized because of a significant rise in the disappearances of honeybee colonies. In short, CCD is “a pathological condition affecting a large number of honeybee colonies, in which various stresses may lead to the abrupt disappearance of worker bees from the hive, leaving only the queen and newly hatched bees behind and thus causing the colony to stop functioning” (Dictionary.com). Although the exact causes remain unknown, scientists have proposed pesticides, mite infection, malnutrition, genetic factors, loss of habitat, changing beekeeping practices, or a combination of the above for the increasing occurrence of CCD. As we depend upon these pollinators for many domestic crops, it is imaginable that we could live in a world without about a third of the food we are accustomed to eating. Although the disappearance of colonies has occurred in the past, it has not been on such a scale as in 2012-2013, when about half of the honeybee hives in the United States were thought to have been lost to CCD. Rudolf Steiner, an Austrian philosopher, predicted in a 1923 lecture that, if we continued to disturb the natural process of hive society and manipulate queen bees, a mass disappearance would occur within 80 years. Unfortunately, it appears that his prediction is coming true. While research continues to expand our understanding of CCD, there are many ways we can help support the honeybee community and our own well-being. Below is a list of resources available online and at Falvey Memorial Library to help you become more bee-friendly. 10 Things You Can Do to Help! 10 More Things You Can Do to Help! Two lists of easy things you can do to make a difference. Whether it’s abstaining from chemical and pesticide treatments on your lawn, planting a few flowers, buying local, organic food and honey, or setting out a birdbath or bee-waterer, there are many ways you can combat the global bee crisis on a local level. Find a copy in your area today with WorldCat or through one of our interlibrary loan services. Make your garden, outdoor containers, or windowsill planter bee-friendly! This list of beneficial plants includes everything from traditional garden flowers, fruits, and herbs to trees, shrubs, lawn tips, and more. The site also provides instruction on making difficult gardening conditions (e.g. clay soil) fruitful and eco-friendly. This is a highly accessible and well-written Scientific American Library Series book by renowned author James L. Gould and his wife. 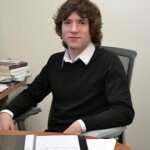 Gould is known for the experiment he conducted that demonstrated how bees can communicate the location of food to other bees through a complex dance system. Written and illustrated by R. E. Snodgrass, this is the classic text on the anatomy of the honeybee. 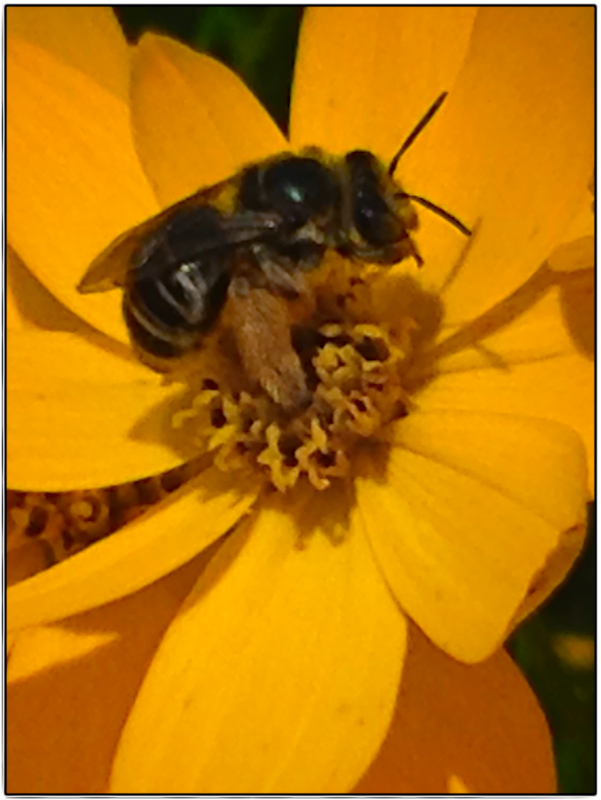 This scholarly article is the first comprehensive survey of CCD-affected bee populations. Since 2009, the U.S. Department of Agriculture’s internal agency ARS (Agricultural Research Service) has published an annual progress report as they strive to increase our understanding of CCD as well as to promote more sustainable bee management practices. Feel free to contact me by email alexander.williams@villanova.edu or phone (ext. 8845) if you have any questions. You are always welcome to leave a comment below, too. 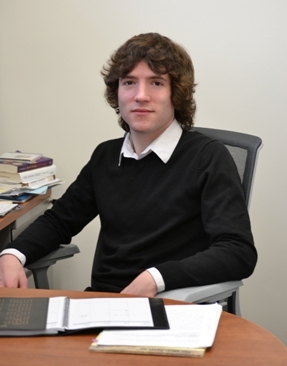 Alexander Williams, ’11 MA, MS is the temporary librarian liaison to the Department of Theology and Religious Studies and a research librarian on the Academic Integration and the Information and Research Assistance teams. Bee photos by Joanne Quinn. Thanks, Michael! I wasn’t aware of this guild.